Join us for our 26th ANNUAL GENERAL MEETING and presentation on Wednesday, April 13 at 6:30 pm in the Small Craft Gallery of the Maritime Museum of the Atlantic. Special guest speaker will be Vincent Leys, a coastal engineer with the Halifax consulting engineering firm CBCL Limited. Vincent will talk about the impact of storms and sea level rise on McNabs Island based on recent work. “We used historical information and computer modeling to see how coastal processes and sea level rise are impacting the shoreline of Maugers Beach and the lighthouse area. This gives us an insight into what to expect in the future,” says Vincent, who has worked on several projects related to adapting waterfronts and harbours to a changing climate and rising sea levels. 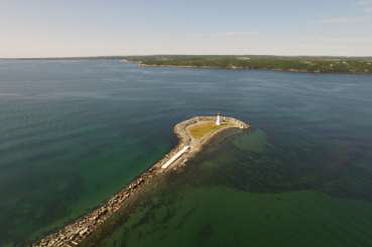 When Hurricane Juan roared over McNabs Island in September 2003, McNabs Pond was breached open and the old isthmus breakwater between the beach and the iconic Maugers Beach Lighthouse was severely damaged. We are pleased that Vincent can join us for our annual meeting. His presentation will shed more light into the coastal processes that are changing the shoreline of McNabs Island. This Annual Meeting is open to the public.